The historic landscape area of Burry Holms and the Tors is bounded by the mean high watermark as depicted on the OS 1:10000 and the extent of unenclosed land along the coastal strip north and west of Llanmadoc Hill. 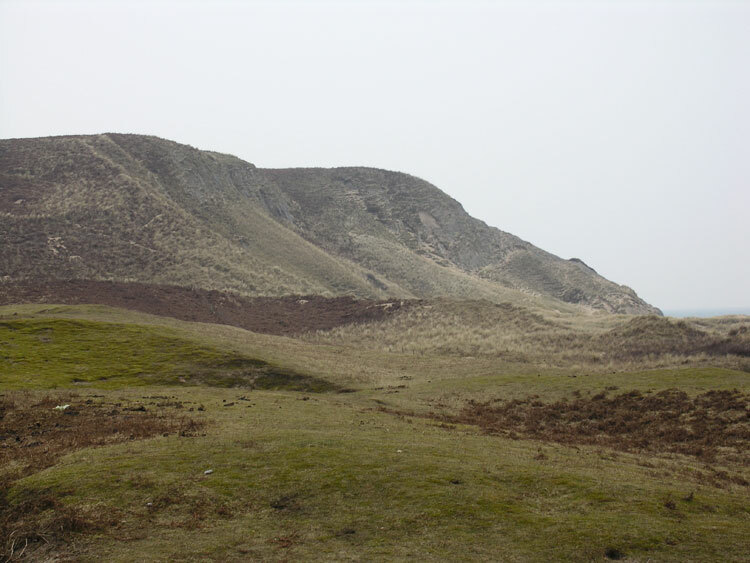 In the southwest part of the area the boundary delineates the higher ground along the cliff edge from the sand inundated area of Llangennith Burrows. This area of coast, in particular, Burry Holms has a rich and diverse history with evidence of occupation dating from the Mesolithic period. The most notable of which is a flint assemblage from Burry Holms recovered during excavations by T.C. Lethbridge and H.E. David (Savory 1984). Tools recorded in this assemblage indicate food processing activities and the coastal location of these objects suggest exploitation of the marine resource. There are a number of caves along this part of the coast, including Spritsail Tor, Prissen's Tor, Cwm Ivy Tor and Three Chimneys (Culver Hole) that could well have been inhabited from the Mesolithic period onwards or even before. However, the earliest evidence recorded from the caves dates to the Bronze Age. Excavation at Three Chimneys Cave (SAM GM087) carried out during the 1920s and 30s recovered a substantial amount of human remains; it has been suggested that this cave formed a Bronze Age ossuary. Activity during the Bronze Age is also represented by a midden (00036w) and a cairn on Burry Holms (00023w). Evidence of occupation on Burry Holms and its development as a focus for settlement is more apparent in later periods. An Iron Age promontory fort (SAM GM088) is situated on the western side of the island. This is fortified by high cliffs and a large rampart approximately 100m long, running north to south across the island following a fault line. The eastern side of the island is the site of a medieval hermitage/ecclesiastical monastic settlement (SAM GM473; 00030w; 94719). Henry earl of Warwick, lord of Swansea and the Gower granted Burry Holms as well as other properties in northwest Gower to the Abbey of St Taurin in Evreux, Normandy between 1095 and 1115 (Savory 1984). This site was known as 'the church of the isle' or 'the hermitage of St. Kenydd-atte-Holme'; it was common practice during the this period for offshore hermitages to be established as a solitary retreat of early monasticism. Excavations of the site in the mid 1960s revealed evidence of a pre-Norman settlement although the main surviving structures were of twelfth - fourteenth century date. The remains include a church, associated dwellings, hall and possible schoolroom. It is probable that the area was continually used between these times as some second century grey Roman pottery was discovered during excavation of the medieval site. Post-medieval activity in the area is of a rural-industrial nature. A number of quarries and limekilns are spread throughout the area along the cliff edges (02447w, 02448w, 02454w, 02446w, 03043w). These are indicated on the first edition 25-inch OS map, where they are described as 'old limekilns' and 'old quarries'.